What do you get when you place over 20 wine vendors on a beach with food trucks and some seriously legit live bands? A Grand Old Time! Even though the heat index was darn near if not over 100, it didn’t stop the wine enthusiasts from coming out in droves and enjoying our much overdue summer at the Lake Michigan Shore Wine Festival. The campground was even sold out for the weekend! People were everywhere but not in the too crowded to move situation which can be irritating. There was plenty of space to get around. Not surprisingly, the most crowded area was the tent where all of the wine vendors were. I’m sure most stayed under the tent because of the shield provided from the sun that was blazing down on us all. I only went in the tent for refills; I’d been waiting a long time for the sun that was present on that day, and I wasn’t hiding from it. I embraced my three shades darker tan, lol…it’s my natural tattoo signifying the official start of summer. 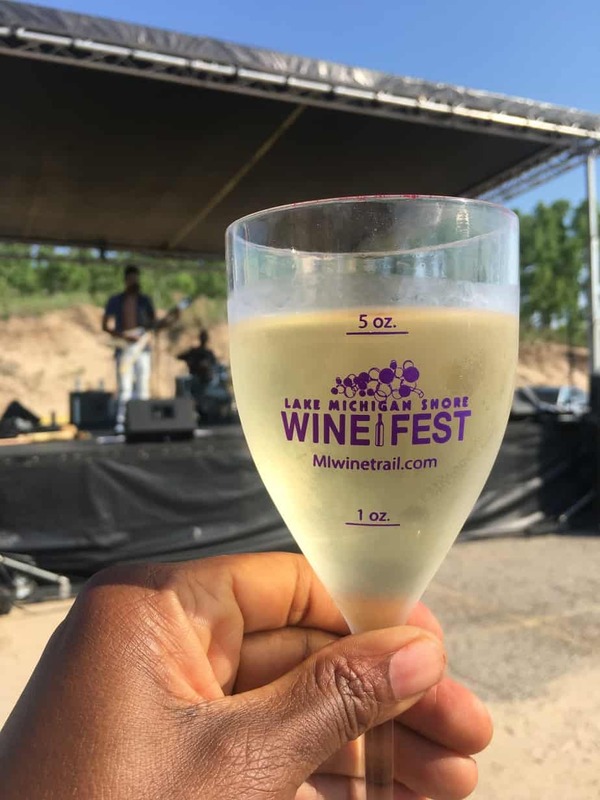 The festival is put on by the Lake Michigan Shore Wine Trail; a collection and collaboration of 20 distinct wineries located in the Lake Michigan Shore AVA. Part of what’s often referred to as the Napa of the Midwest, this regions holds 90% of Michigan’s Vineyards and extends as far north as Fennville, as far east as Kalamazoo, and as far south as the Indiana/Michigan State line with Lake Michigan as it’s western border. Such a gem right in our backyard! Lake Michigan provides the ideal climate for growing wine grapes. The famous “lake effect’ has a positive impact on the growing season and protects the crops. (I’ll try to remember this the next time I’m stranded in a snow storm!) Most of Michigan’s grapes are grown within 25 miles of the lake. This year the fest was held at Warren Dunes State Park in Sawyer, Michigan. I’ve attended the festival in the past in Bridgman, MI but I admit, I favor the space of Warren Dunes. Plus the beach is just beautiful! I plan on returning before summer is over and climbing those dunes. There were some good discoveries. I’m kind of obsessed with Lazy Ballerina winery in St. Joseph and I also think that Paw Paw, MI needs to be the location of my next winery crawl. No fest is complete without good food vendors! The food offerings ranged from healthier to the bad but oh so good! Let’s be real; I don’t generally go to festivals to eat good, I’m just saying! However, I was pleasantly surprised by Nosh Village. I may have tried to start off with the healthy option because I’d been eating badly the whole week leading up to the festival. Nevertheless, my Buddha Bowl was lit, and I could’ve easily eaten another and not felt like I was missing out on the other festival food. Their food truck can be found at Watermark Brewing company in Stevensville, MI. Healthy eats while enjoying a brew…that’s a nice balance. The Bahn Mi from Pachama Street Food was also delicious. My husband did go for seconds on that one. Others from our party hit up some of the other vendors. There was something for each of our preferences; Bar-B-Que, pizza, tacos, and sweets. I didn’t leave hungry, that’s for sure! The music had us moving and shaking even with the intense heat. Live music outdoors is one of my favorites summer activities. The Jamiah Rogers Band was on fire! This young guitar hero is the bomb! If you make it to the Chicagoland area, you have to look him up; you won’t be disappointed. The Motown grooves from The Hemispheres was also a delight. They had the people up and moving for sure! Hats off to all 5 bands who showed up and showed out! The festival had a nice balance of food, wine, and musical fun! This event is put on every year and should be on your summer must-do list. If you missed it this year, be sure to catch it next year. In the meantime, the Lake Michigan Shore Wine Trail is a good idea any time of year! Check out the map of the wineries here!